Breeding season is here! This is the time of year when it will get rather stinky for the citizens of Los Angeles. Females have already given birth. The most common places are in a crawl space or under a deck or structure. They want a nice cool and dark place safe from predators and humans. If you are smelling a Skunk this is a good time to call a Skunk Removal professional. If you live in Los Angeles California and are having Skunk problems this is not uncommon. More skunks are coming into the city of Los Angeles looking for food, water and shelter. Wild fires, floods, drought and urban development force these animals to look else where what they need to survive. Skunk control can be helped by the citizens of Los Angeles. Skunks are scavengers when it comes to your garbage. If your garbage isn’t secured in a tight container, skunks will rip it apart looking for something to eat. Skunks also love to eat pet food, so keeping your pet food inside at night is a good idea. Pet food left outside on a regular basis will attract skunks and other wild animals to your yard. Skunks will also cause damage to your yard. Skunks will dig up your grass looking for grubs that they like to eat. If you find little holes dug all over your lawn then you probably have a skunk living in your yard or roaming the neighborhood. If you have a vegetable garden they will take and eat whatever they want while you are sleeping. Skunks also like to make a den under your house in Los Angeles. This can be bad especially when they decide to spray under your house. Skunk spray is very strong and can take days for the smell to go away. It is important to call a professional skunk trapper as soon as you discover you have a skunk hanging out in your yard on a regular basis. Skunks aren’t afraid of dogs or cats, if chased they will just spray them. Skunk spray can blind your pet if it gets into their eyes. 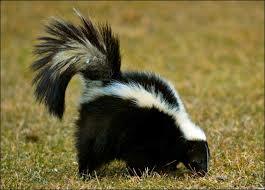 If you are having a Skunk odor problem our skunk removal professional can help with that too. When skunks spray under your house or close to it, this can cause your home to become unbearable to stay in. Our company has developed a machine that get your home smelling like new in just 24 hours! Removal of the skunk is the first step, then we can get the odor problem under control in your home in Los Angeles. Whatever skunk issue that you are having we can take care of it! Give us a call today for Skunk removal and control in Los Angeles. We have offices in: Long Beach, Palos Verdes, Beverly Hills, Silverlake, Anaheim, Burbank and Malibu.